Leah Umbagai paints Wandjina images, as well as pictures of constellations like the Seven Sisters and Wallungunder. She is also an Executive Councillor for Mowanjum Aboriginal Art & Culture Centre. In this interview, Leah talks about the Kimberley rock art and what it means to the traditional owners. You’ve been out looking at the rock art recently. Can you tell us about that trip? Just going and looking at a rock painting by our tribe is very important to us. We need to know about the paintings. We want to learn where the art is located. On top of that, we want to understand more about the proper protocols of how you announce yourself and how you need to behave while you are at these sites. There is a certain attitude that is required in the lead up to going to the rock art and leaving the rock art. There are different protocols that you have to abide by according to the laws of the area and the people. I’ve done it so many times. I know my place and what to do and how to do things. On this visit, I had others with me and it was their first time. It took a while to get them to understand because some of them were so young. I needed to spend time helping them understand what they need to know and how to show respect for what is there. 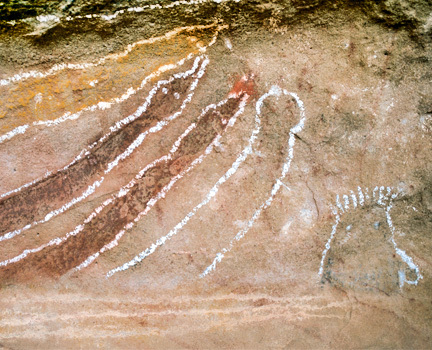 The Mowanjum Aboriginal Art & Culture Centre organised it with some of the rock art researchers. This site is also of interest to the WA Museum. This art is old, it belongs to a group of people, and it is a story that we can tell as a tribe. This new research has given us another new way of sharing our stories. These are westernised ways, that give more of a technological way of seeing the cave, going to it, viewing what’s there, and recording that this art is out there. We went to a rock art cave that’s just near the Freshwater Cove. We weren’t really looking for other rock art. We just went to see that particular cave. What were the highlights of this trip for you personally? Just going back and visiting the cave, and also taking my nieces and nephew with me to see it. I was just telling them their mother didn’t get a chance to come and have a look. They got to go there before their mothers did. That’s a big honour to them because they’re just young ones coming back. The area is difficult to access. So you can’t just get there every day and have a look. This was a wonderful opportunity to go back and show our own people around. This is the reason why we go and visit the caves. This is the reason why they repaint it. It’s to keep our tribal legacy, our stories and our legend strong. When you belong to something, if you let that go you become no one. It’s not just about the painting. It’s more about who we are as people. Can you describe the sort of art that’s in that particular cave? It was Wandjina rock art up in a Worrorra cave. There are big figures of owls that were drawn because the owl is the most significant animal that we say is very important to Wandjina. They also had pillars. They had rocks that they used to grind with. We also have a burial site in that cave. There were small paintings, but you could see that there would have been heaps and heaps more paintings, but because of the wash as well as the country in the rainy season, a lot of them were blocked off. You could only see some of them. How old do they estimate the artwork in those caves is? My grandparents have seen them. We’ve known this forever, so it was a generational story to tell. As far as I can go back in family history, it’s been there forever. It’s the Lai Lai (dreaming of creation and Country). As an artist, Leah, how does the art make you feel? I feel very proud of myself and my people. These stories and the paintings were left there for a reason. For us. We have to show that it’s been left there for our generation and our childrens’ generation. Future generations of people need to understand it is significant and spiritually important to us, the Wandjina people. We are not just born into it, it is who we are. I felt very happy in myself, and I think just the presence of being there made me feel so much emotion in my heart. I don’t know how to explain it, but you feel really good and proud and a sense of belonging because that’s your area. That’s your country. That’s your tribe, it is who you are. That’s the painting that we follow the laws of, so it was so much more than an educational experience. It is an experience of belonging. You’re feeling what the country would be. If we weren’t going there, it’s empty, you know? It is so important knowing this has always been there. The Lai Lai, old people, our ancestors, left this art to teach us about their lives, creation. They’re still teaching us, but now it’s in a different way. We are using technologies to learn more about the art and the lives of our ancestors who made it. How did the young people respond to the art? They asked a lot of questions. They asked about the protocols and why do you have to do this? Who are these images? Why are they there? We had a lot of questions, especially from my niece. We answered as much as we could. I’ve seen it before but it was the first time for them. I’m trying to understand what that’s like for them. That particular cave is such a special one. It’s the only one of its kind. I could see the young people just trying to understand it but in their own way. Are there protocols that you can explain to westerners? My people only come from just one area. There are other areas that have their own protocols in how to approach their own rock art sites. Every single one is different from the other. I can’t tell you one thing and then you go and use it to approach the art of another tribe. No, that won’t work. Every single tribe has their own different protocols about how you should approach these sites. We’ve got three tribes, the Worrora, Wunumbul Gambera and Ngarinyin. We have planned routes within those areas. We also have the Wandjina images in other tribal areas. People travel around and they have a different way that their art has been painted. Some customs do cross over within our region, but there are often different protocols and laws that apply in different areas. People need to understand and abide the laws and customs of the land. Does the rock art have a different sort of meaning from area to area? Not from the Wandjina. If you’re talking to us directly for the Wandjina, I can’t speak for anybody else. Within the Wandjina tribal group areas, it doesn’t vary. They have the same approaches. 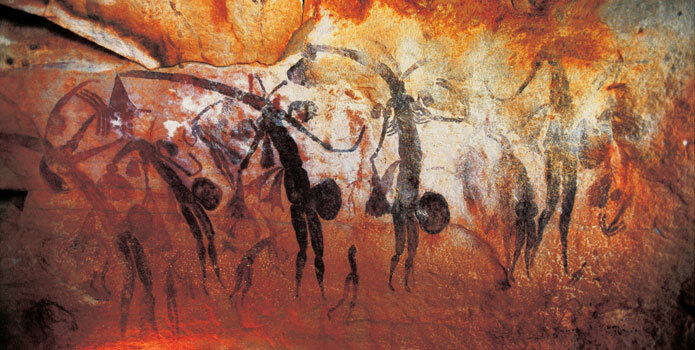 If you have to approach a particular Wandjina image that’s very significant to your tribe, you call out. You say who you are, why you’re coming there, and then you have to put body paint on for that particular area on your skin that you are as one of the three tribes. Then you also smoke because sometimes it’s the first visit for people. It’s not a smoking ceremony as people might have seen in other places. There are different ways that we have to smoke. They’re only for particular things. You can’t just go out and smoke whenever you feel like you want to smoke a person. Maybe they fell off a tree and you want to get them better. No, it’s more of a tradition that’s been passed from generation to generation. A lot of people ignore that. We, as the custodians of the Wandjina tribal area, we feel responsible for ensuring the correct procedures are followed. I want people to understand that you can’t just walk in and grab things. You might see a beautiful painting, a rock painting but it is not ok to take a photo with it in the background. It is not ok to pick things up in a cave and remove them. The whole point is that this rock painting might just be a part of a message. You might have a stick that’s pointed in a particular way. That meant the whole painting is probably relating to the stick with a particular message. There’s not only painted rock art on walls. Art can be on small rocks, it can be on tools that we use, even the area, and even the people. The appropriate approach is so much deeper than me saying you have to paint yourself before you go to this cave. There are rules that we have to abide by. The reason why these things have to be done. You have to call out, you know? There’s a reason for you to say your name, who you are, what you’re going there for. Identify who you are. You know, little things like this. It’s really in-depth information that we have to abide by, even just to go there. These days most of the care and protection of the caves, is that done by the traditional owners? Yes. We try and protect them as much as we can, but you still get visitors who want to do their own thing. They want to go places by themselves. They show little respect for the fact that this is our backyard. People wouldn’t like if I turned up to their house and went inside and start eating and drinking and sitting on the couch. It is disrespectful. It might sound silly, but that’s what we feel now. That people just go and do whatever they feel like doing. They take the pictures that they take, some are not good. Some of this art is intended to be viewed only by women or men. It can be sinful for the eyes of men and sinful for the eyes of a woman. Some visitors disregard the little nitty gritty stuff about photographs and information because they don’t appreciate that it might mean something very important. Unguided visitors can also use a little knowledge to form an incorrect interpretation of what they are looking at. They end up missing out on so much because they aren’t taking the time to be guided by people who understand the art and what it means. A good guide can help observe protocols and help people really understand the meaning behind what they are looking at. To go there on your own is disrespectful and cheating yourself of a far deeper cultural experience. Everyone loses the chance for connection and exploring the deeper meanings behind things. The beauty, respect, and enjoyment out of the country will be passed by without understanding the uniqueness of the whole experience. Are there other things that you’d like people to understand about this art? Just recently I met someone from a different tribe trying to draw the Wandjina. You can’t. If you’re from a tribe, you have to find yourself within your tribe. You have a song, you have a dance, you have a connection to the country from where your ancestors, grandparents, and parents originated from. We don’t choose our country. Country chooses us. It’s unique to you and your connection to your area. We are put in a place for a reason. It isn’t for nothing. We’re here for a reason, and everybody has got their own purpose. We say each tribe has their story. Each child has to have a legacy in life that they have to uphold and fulfill through their dreams, through their laws, through their tribe, through who they are because we say we don’t own the land. The land owns us, so we are there for that purpose. What would you like to see happen in the future about this rock art? Let me summarise that for you. Here is what I think is important. I’d ask people to stop taking photos. I’d like them to really understand the area and get protocols in place and take a guide. Not just walk wherever they want to walk and record images without permission. If they have deep questions, just try and understand that now a lot of people have been removed from their homelands. Visitors might not get as much information from a local person as they would from a trained guide who is an authority about their own traditional areas. You might find people who only know a little bit. Look for someone who can say, “Yeah, that’s my country. I can take you there,” and who can really give you an understanding of the country. Some places can be so beautiful, you know, and prestigious, but it has a meaning to it as well. That has to be known so visitors can really understand and get a feeling of the land, of the people, of the country itself and what’s out there. There’s so much more to it than what is on the surface. Having the proper guide isn’t all you need. You also have to be aware of what you want to talk about. Be specific because a lot of the people, just say, “What’s this thing here?” They’ll give you just that. I suggest that people make sure that they have good questions that they want to ask. If you ask poor questions, you’ll get poor answers and end up feeling, “That was a waste of time.” Things like that. I’d rather people ask me the appropriate questions because if they ask me one thing, I’ll just give them one thing. What are the key messages you want teachers to get across to their students? Don’t just get students to draw the Wandjina. Yes, it’s a Kimberly art, but only the people of the tribe are allowed to draw these images. Also, if they’re drawing other people’s images, like the desert, you don’t allow kids to do paintings of particular things because it is specifically for that tribe, for Wandjina especially. We have different Wandjina’s for different areas. They need to be of that group, you know? You just can’t go out and draw it because it is taking something away from us that’s being used. They disrespect us by dishonouring why this picture is there for a reason, for us. Even figures, you know? Don’t just draw any figures. Have the understanding of what it means. I want them to teach that Wandjina isn’t for everybody to draw. It’s something that needs to be respected, so people can know about it and know that it’s there, and it’s sort of a symbol of a direct lineage between these ancient traditional owners. It’s the oldest living culture in the world, but it isn’t something to be taken away and used by other people in photographic form or in drawing form. We are who we are. We are Wandjina people. Are you happy for them to see photos of it? Yes, I am happy for them to see properly sourced images. We get a lot of people sending us photographs of paintings, and then they want to draw it. Then you have these people drawing these images, and then putting it their own different ways, like cartoons. That really hurts us because no, Wandjina is not a cartoon. It’s not for anybody just to scribble and just draw in any way. If people want to visit the rock art with a skilled guide or if they want to check up on what is ok they can contact us through the Mowanjum Art and Culture Centre. 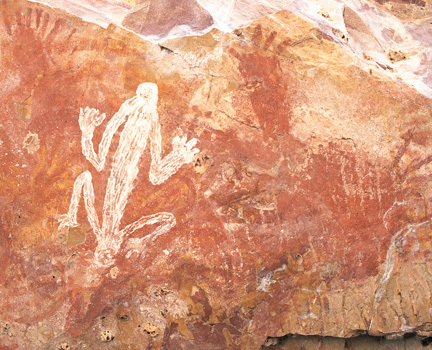 The Wandjina image is now subject to copyright so it is important for people to get permission for the use of that image. Ideally, people would show proper respect and would leave the Wandjina and images to the people from which it came from. They would go and create different images of their own. We are keen to share our story and our culture. We need this to be done respectfully. This makes for a better experience for our people and for our visitors as well. Everyone can be happy and so much can be shared and enjoyed together if things are done the proper way.